Lets start the new year by getting some Organized Play rankings out. I've been behind getting races recorded but caught up recently (well, mostly). 117 drivers have participated in a race so far this year. Already more than participated in all of 2017. Interestingly, average field size has grown to just above 10 drivers per race after 5 consecutive years of decline. Last season a race averaged 9.2 drivers. More importantly, lets look at Don's crazy 1st half of a season. Four wins (most so far) in nine races and every win has been against good competition. From each of those 4 quality wins, Don picked up at least 30 pts. No one else has more than two races where they got 30 or more from their win. On a related note, I added something to the race list. I now list the points gained by each driver that podiumed in every race so you can get a sense of how people got their race points. I'll duplicate this for tourney once a tourney ends. 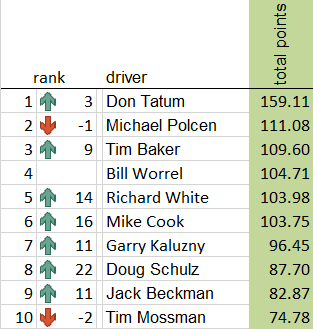 Speaking of tourneys... no driver has any points from them yet because I have not gotten results from any (well, actually I just got results from the Detroit series, but don't have the final race for that season yet). When those come in things may get tighter up top. Despite Don's impressive run, Tim Baker is doing almost as well but has just participated in fewer races so far. Tim's two wins have been worth 30+ points and Tim is leading Don in both the P1 and Redscape online series which have been two of the top three series the last two years running. Still lots of racing to go so it will be very interesting to see how things progress.